I honestly couldn't wait very long to write about this next company because of all the neat products they have with of course an environmentally friendly twist. Bambooki is a company that prides itself on providing the most up to date bamboo made products to be used in the most "green friendly" manner possible. 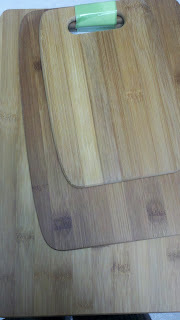 "Bamboo (the sustainable raw material) + KI (the mother-earth goddess) = Bambooki Inc., a place to find the best in bamboo. With over 1000 products, Bambooki.com is an online shopping website featuring the top bamboo and environmentally friendly products for your indoor, outdoor, and everyday needs!" 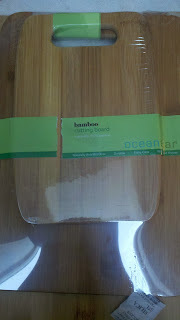 I was given the Oceanstar Design 3-Piece Bamboo Cutting Board Set to review. I LOVE this set as not only do I love the look of bamboo but these boards are stylish and add a classic look to my kitchen. Even though you can not easily throw a bamboo cutting board into the dishwasher to clean I love prepping food using these as it seems to be so much better for my knives. Whats great about this brand is that they carry more than just your bamboo kitchenware but things you wouldn't even think of which are made from bamboo like sunglasses, clothing, bicycles, beauty products and so much more. I love having one place to actually shop for most needs in my home. Growing up my grandma always had a wooden cutting board but I could never find one in stores that was really wooden, mostly plastic and so forth, so its great to see a company who uses bamboo, I cant wait to try this product!